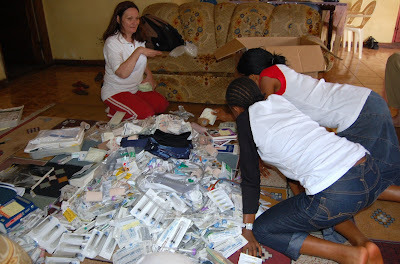 On our initial stop at Kroo Bay during our "Salone Mission 2008" we brought along some needles and syringes. We did this because I had seen a BBC Journal of the medical staff of Kroo Bay Clinic and they made comment that they had no needles, no syringes to care for the sick. 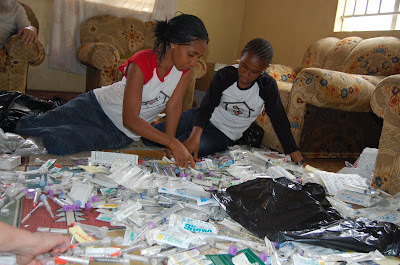 We had more than enough for the Kabala hospital we are supporting and decided to share a bit with Kroo Bay Clinic. After witnessing the great need and the struggle of the staff of their Clinic to provide care to its patients, NHA went back to St. Laurence House, re-sorted our supplies and brought more to this clinic. This was the morning before the horrible rain storm that killed 10 people in Kroo Bay. It devastated the area.